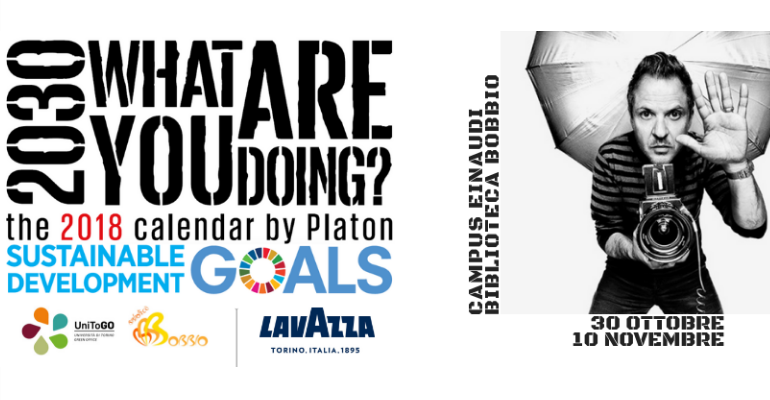 The Green Office of UniToGO and the Biblioteca Norberto Bobbio are happy to invite you to the photo exhibition of the 2018 Lavazza calendar“2030: What Are You Doing?” focused on 17 sustainable development goals of the United Nations. The 2018 Lavazza calendar – a creative project by Armando Testa – and the related exhibition are made by portraits (made by the photographer Platon) of 17 ambassadors committed for environmental, social and economic sustainability, who witness their concrete commitment for sustainable development. Among the 17 ambassadors, there are some important names such as the director of the UN network for Sustainable Development, Jeffrey Sachs, the founder of Slow Food Carlin Petrini, the chef Massimo Bottura, the American actor Jeremy Renner, the ocean activist Alexandra Cousteau, the tennis champion Andre Agassi and others. At the inauguration of the exhibition – on 30th October at 6.00 pm at the Biblioteca Bobbio of the Campus Einaudi – the delegate of the Rettore alla Sostenibilità Ambientale Egidio Dansero and Giacomo Buchi, teacher at the Economics and Management department, will talk with Laura Tondi from Lavazza, about the question at the centre of the exhibition “What are you doing?” for sustainable development. They will also talk about the importance of the awareness of citizenship also with artistic events, such as the urban work of art, promoted by Lavazza and Città di Torino and created by the artist Vesod Brero in Viale Ottavio Mai and presented during the Festival dello Sviluppo Sostenibile 2018.